Your new primitive wood chandelier may one day become a family heirloom if it is given proper care. Over the process of time your chandelier will collect dust, to remove this, periodically, take a soft flannel cotton cloth and wipe the surface of the chandelier gently or a hair dryer set on the cool setting can be used to blow dust from hard to reach crevices. While cleaning do not twirl your chandelier, move around the chandelier to clean it, as twirling it puts undo strain on the wiring and mounting hardware. Primitive, country and colonial chandeliers are made from varying wood and metal components, which are then finished with a vast assortment of stains and paints, For this reason following manufacturers recommendations in regards to chandelier care is always best. We do not recommend using products that contain silicone or wax to clean or restore the luster of your chandelier as they leave behind a residue build up. A damp cloth and some gentle treatment will go a long way to restoring a beautiful sheen to your fixture. If you decide to use a furniture care product on your chandelier, do not spray it directly on the surface, spray it on a soft cloth and then test its effect in an inconspicuous area. Crackle finishes and paints without any protective varnish will be more susceptible to damage from acidic cleaning products, so be extra careful with these surfaces. A product that we have found to respond well to a vast array of chandelier finishes is Heirloom Essentials Fine Furniture Polish & Cleaner by WoodWright. 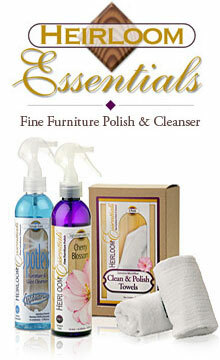 We have had good success when using this product on an assortment of finishes. However, one should never assume, always test first.